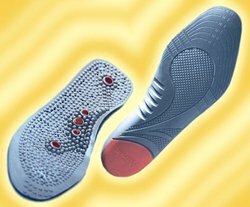 The MagnaSoles shoe inserts stimulate and soothe the stressed and sore- footed wearer's feet using five forms of pseudoscience. Magnets, reflexology, and healing powers have made MagnaSoles a very popular item for those individual's who have been feeling a great deal of pain. What are MagnaSoles? What are the Implications behind the Magnasoles inserts? The Contour Points also take a semi- plausible medical technique known as reflexology. Reflexology establishes a correspondence between every point on the human foot and another part of the body. 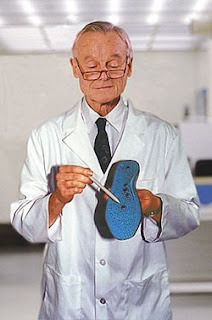 This correspondence enables the soles of an individual's soles to heal your entire body as a person walks. Not only does the power of Magnetism and Reflexology play key roles into the appearance and usefulness of MagnaSoles; but also according to the website, "Only MagnaSoles utilize the healing power of crystals to re- stimulare dead foot cells with vibrational biofeedback...a process similar to that by which medicine makes people better." Dr. Wayne Frankel of California State University is a biotrician who discovered Terranometry. Frankel states that the principles of Terranometry resonates from a very precise frequency, which is imparts to the surfaces it touches. Frankel states,"If the frequency of one's foot is out of alignment with the Earth, the entire body will suffer. Special resonator nodules implanted at key spots in MagnaSoles convert the wearer's own energy to match the Earth's natural vibrational rate of 32.805 kilofrankels. The resultant harmonic energy field rearranges the foot's naturally occurring atoms, converting the pain-nuclei into pleasing comfortrons." MagnaSoles began at a starting price of $19.95. Individuals who are buying the shows are claiming that these new shoes are an alternative form of the expensive, effective forms of traditional medicine. Some customers who had claimed that they had an awful twisted ankle and after purchasing the inserts after wearing the insert soles for 7 weeks- they noticed a significant decrease in pain and can now walk comfortably. "Just try to prove that MagnaSoles didn't heal me!" After reading the reviews by the customers I have found that the information sounds very in depth and detailed, however customer reviews seem a bit bias. The woman who claimed that she had a terrible twisted ankle, said that after 7 weeks she felt better. However, after 7 weeks any twisted ankle should be fully recovered. Is it the soles, or is it just time that healed the twisted ankle? Depending on the indivual's belief the MagnaSole may be a beneficial purchase, nonetheless it is all a form of pseudoscience due to its lack of generated research and actual evidence that it does in fact heal those stressed and sore footed people. Psychic Surgeries: More Harm Than Good? Lavender Oil: The Miracle Treatment? The Cinnomon Challenge: Really Dangerous? Can Lightning Strike The Same Place Twice? Out of Body Experiences: Real or Just a Dream? Is it in the blood,or in your mind? Criss Angel: Satanic or Not? Visitors, From the Outside.. WHOAAA!! !